Buick has not gifted the market with a minivan or a true station wagon but it compensates for it by delivering its mainstay vehicle, the Buick Enclave. Offering something between the flexibility of a minivan and the long-roofed goodness of a real wagon, without the stigma of wither, Buick Enclave a perfect substitute for those good old family shuttles. The Enclave is part of a trio of GM crossovers and to most of the SUV lovers it is the most appealing of them all. The hints of coke-bottle curve on its sides, the waterfall grille give this full sized star a personality far enough from the rugged looking GMC Acadia or the insipid Chevrolet Traverse, while all three of them share the same innards. What haven’t changed much are the new grille and the LED lighting. On the inside the Buick Enclave seems to have undergone rejuvenation with the new soft-touch dash and a big touchscreen. 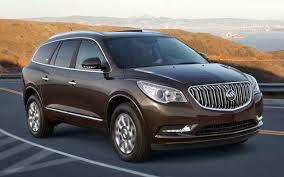 Nothing has changed under that sheet metal for the 2014 Buick Enclave. Still spinning on the same 288 horsepower as before from its standard 3.6 liter V6 engine and the same six speed automatic transmission, the beast reins with an option of channeling it to either the front wheels or to all four wheels. The indecisive transmission from the last year has been lost for the new Buick Enclave features much less hunting through upper gears and the powertrain never really struggles to tap cruising speed despite a heavy curb weight. The gas mileage is 24 mpg mat max. On the inside, the Enclave brings its customers the IntelliLink as the big news. Bringing up the interior of the ruling monster to the leading edge in connectivity, with a relatively easy interface, well integrated Bluetooth hands-free calling and audio streaming functionality and apps for Pandora and Switcher audio, the IntelliLink transforms the driving experience into a high tech and amazingly entertaining one. The standard equipment this year includes a rear view camera system, a USB port, HD Radio, satellite radio and voice recognition, while navigation is optional as is a ten speaker Bose sound upgrade. While it shares the platform with the Chevy Traverse and the GMC Acadia, the Buick Enclave boasts fancier styling and richer interior furnishings than its cousins. This niche of the crossovers, however, doesn’t lack choice. The aforementioned Chevy and GMC relatives are still a good idea on the basis of styling and lower price tags. The Ford Flex offering its wagon like styling and a turbocharged V6 grunt is funkier at the same time and stands as tough completion to the 2014 Buick enclave. So does the Mazda CX-9 with its more athletic handling and equally spacious interiors. If dropping down in size is not a big issue for you, higher-end rivals like the Acura MDX and Infiniti QX60 boast even nicer interiors, advanced features, and in the case of Infiniti – a hybrid powertrain. The MDX, however, offers the best overall characteristics of any three-row SUV in this price range. But in front of all these worthy vehicles stands proud with the handsome styling, enormous cabin and competitive pricing, the 2014 Buick Enclave!